From 1900 to 2000 the human population nearly quadrupled from 1.6 billion to 6.1 billion. Sometime in 2011, it will surpass 7.0 billion. The reason is not that people started reproducing like rabbits, but that people stopped dropping dead like flies. In 1900, the average global life expectancy was 30 years. By 2000 it was 65. In other words, we haven’t experienced a population explosion as much as a health explosion. While increasing health was a hallmark of the 20th C, declining fertility could be a feature of the 21st C. According to the UN Population Division and the US Census Bureau, the average number of births per woman has fallen from 4.9 in the early 1960s to 2.5 nowadays. Furthermore, around 50% of the world’s population live in regions where the figure is now below replacement level (i.e. 2.1 births per woman) and almost all developed nations are experiencing sub-replacement fertility. You might think that developing nations would make up the shortfall (especially since 80% of the world’s people now reside in such nations) but the majority of sub-replacement populations are in developing nations. If economic growth returns to pre-recession levels, we could soon see catastrophic manpower shortages globally. The US Census Bureau says the absolute rise in the number of working age (15-64) people globally from 2010-2030 will be 900 million - 400 million fewer than 1990-2010. Moreover, regional differences in fertility mean that rises will take place in unexpected areas. Since 1990, increases in population have largely occurred in China and India. But over the next 20 years, the largest increases will be in sub-Saharan Africa (around 33% of the total). Other areas that will experience rises include Bangladesh and Pakistan. Together, China, India, Bangladesh and Pakistan will be responsible for almost half of all global increases. Breaking the data down by age group also reveals some additional surprises. The greatest decline in young manpower will occur in China, for instance. Implications? First, China needs to develop economically before this demographic implosion hits. Second, if other factors such as technology remain constant, economic growth and material expectations (and consumer spending) will fall considerably below the norm. In China there are 120 boys for every 100 girls and this gender imbalance could create a generation of disturbed young men. Forecasts suggest that by 2030 more than a quarter of young Chinese men in their late 30s will never have married - and will perhaps never do so. Other implications include a shift in innovation clusters towards areas with younger populations (because youth is one of three key drivers of innovation) and rising levels of discontent. Russia is another country with demographic problems that could derail an economic promise. Since 1992 the number of people dying has outnumbered those being born by a massive 50%. Indeed official figures suggest the country has shrunk by 5% since 1993 and life expectancy is marginally lower than in 1961. By 2050, Yemen’s population will be larger than Russia’s. By 2030, 21% of the Russian population will be aged 65+ and the highest concentration of mortality will be among the working age population. In the north of India, the population is booming due to high fertility rates, but in the south, where most economic development is taking place, fertility is falling rapidly. In a further twist, fertility is highest in poorly educated rural areas, but education is highest in highly educated urban areas. In total 25% of India’s working age population has no education whatsoever. In 2030, a sixth of the country’s potential workforce could be totally uneducated. As for Japan, the fertility rate is approximately 35% below the necessary replacement level and this has huge implications for productivity and public debt. Western Europe is not quite in this position, but the region is expected to experience population stagnation, with Germany – the region’s economic powerhouse - experiencing population decline. One solution is obviously to import foreign workers via immigration, but this has been problematic for Japan, UK and France. But the US is almost unique among OECD nations in having a population that is expected to grow by 20% from 2010-2030. Moreover, the US has a track record of successfully assimilating immigrants. As a result the US will see a rise in the size of its working age population. This doesn’t automatically mean that the US will remain an economic powerhouse, but its economy is more resilient than many people imagine, especially if the US can solve the critical issues of healthcare and education. Many demographic futures are quite gloomy, but there is also some hope that technological innovations will address many of the challenges associated with shrinking populations, especially aged healthcare and economic productivity. There was a report in a newspaper a while ago about a mother who had sent a shipment of rubber flooring to a rented villa in the south of France because she was worried that her toddler might fall over on the old stone floor and hurt herself. Crazy? Yes, but also an articulation of a common fantasy. Namely that we can control everything and that life can be made risk free. And behind this fantasy lies another – that we can create the perfect child. This thought – that children must be carefully monitored, fussed over, organised and engineered – means that pregnant women are told not to drink, that kids (and houses) must be kept dirt free, that boys shouldn’t climb trees and that all children should be protected from strangers, but also from idle afternoons playing outside by themselves. Parents that believe in close supervision and organization can be seen from a distance. They are usually the ones carrying small bottles of disinfectant in case their child touches something from outside their closely protected and cleansed environment. These are the parents that treat boredom as a disease and have sorted out their child’s career path in utero. These are the zealous mothers (it’s usually, but not exclusively, well-educated mothers) who go out of their way (literally) to ensure that their children mix with the right kind of kids and fill every available moment with some educationally worthwhile outcome. These are the parents that buy Baby Einstein CDs, who work side-by-side with their prodigies, helping them with their homework, often actually doing it for them. And don’t think that this ends when their child reaches their teens. In the US, colleges are reporting that they have to give parents explicit instructions as to when to leave their 17- and 18-year-olds at school, because otherwise the parents won’t leave. Similar stories about excessive control can be heard from employers who have to instruct parents to leave their children alone for interviews or even at work. But is this high-level watching, prodding and manipulation doing any good? Are lives being made any happier? Even putting aside the argument that exposure to dirt helps kids to develop strong immune systems, there’s the argument that we have pushed things too far in the kids’ direction. Life has become too much about them. Why could this be so? One reason is a mixture of economics and demographics. People are having fewer kids and a globalised world is more competitive, so you might as well get the little tykes performing as soon as they leave the womb. The other explanation is psychological. Paying excessive attention to children is a way of deflecting attention away from our own disappointments. The attempt to create the perfect child is a way of compensating for the fact that we have perhaps given up on something in our own lives. That work, marriage or life has not turned out quite as we planned. And therein lies the lesson. Life isn’t perfect. People will inevitably have problems. Failure and hurt will happen sooner or later and building in such experiences early through benign neglect creates resilience. While it would not be recommended that children be exposed to torment or extreme danger, they should at least be exposed to boredom once in a while because it is in these unsupervised, unstructured times that the imagination blooms and people truly become themselves. Is the middle class revolting? If you are reading this in Asia, stop. It won’t make any sense whatsoever. Elsewhere, in the UK and US for example, the idea of the ‘squeezed middle’ might mean something. This is the thought that rising taxes and higher household running costs are putting real financial pressure on the middle classes, while at the same time the rich and poor alike carry on much as before. In 1980, 8% of US workers received 16% of national income. The same amount now falls into the hands of just 1% of the US population, while the top 20% take 50%. The figures are similar in the UK and across parts of Europe. The gap between the top and the middle is now wider than at any time since 1929 and while the rich have always been with us they are now more numerous and more visible. If an economy is booming, no matter. But if the financial situation of ordinary people looks bleak, then attention is focused towards those who are not sharing the pain, especially those that are thought to enjoy considerable advantages when it comes to minimising tax. Writing in the Financial Times, Max Hastings reports that he was recently taken to a very expensive restaurant in London and noticed that few, if any, of the people sitting at the tables would be paying much tax. I was taken to a similarly priced restaurant not so long ago too and noticed the same thing. Outside the snow was falling and there was the chill of recession in the air. Inside – past ranks of chauffeur driver Bentley’s waiting outside – the customers looked calm and were carrying on without much of a care. 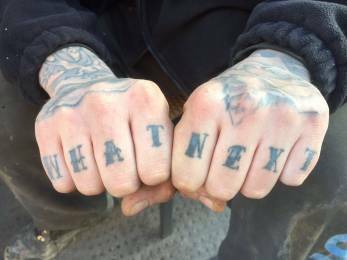 So what’s next? Should we expect a Marxist revolution with the working classes replaced by those in the middle? Probably not. In some regions we may see a middle-class protest movement developing, similar in some ways to the Tea Party in the US, but elsewhere I suspect that the middle will just muddle through. Yes, it’s true that some regions are facing up to a period of relative decline and this creates a general feeling of unease. Add to this rising food prices, increasing energy costs and tax hikes and things could get quite unpleasant. But in the UK all the government plans to do is to take public spending back to 2004 levels. Hardly the Dark Ages, WW2 or the Black Death is it? There are serious long-term issues at play here. 77% of Americans, for example, think that their kids will have a worse quality of life than they’ve had and 57% think that the next generation will inherit a generally worse situation, according to the writer Frank Luntz. But what’s really breeding discontent is not reality, but fear and anxiety about the future. What is more worrying than an ‘Age of Rage’ is a slow shift towards authoritarian governments in the West where middle class voters exchange freedom and liberty for economic stability and clarity about what lies ahead. Can governments keep secrets in an age of digital files, flash drives and anti-secrecy radicals? Information has always been leaked, especially to journalists, but the historical trickle now looks like becoming a torrent. Twenty years ago, all a potential whistle blower needed was access to a photocopier for a few hours, reams of blank paper and a friendly journalist. Now all that’s required is a flash drive and a few minutes. As a result, secrets are becoming harder to keep and politicised geeks represent a new threat to governments and security services alike. Hence, secret wars are now harder to fight and corporate conspiracies become uncovered sooner rather than later, due not only to the ease with which data can be collected, but also the speed with which information can be broadcast around the world. Good news. But let’s keep this in perspective. The recent leaking of US diplomatic cables, received and subsequently released by WikiLeaks to selected media outlets was essentially a technical failure. It is the role of governments to keep certain things secret and in this instance they failed. Interestingly, before 9/11 each US intelligence agency had its own confidential network. But following criticism about not sharing, each network was integrated into a single system and became vulnerable as a result. But, again, let’s not get too carried away. The media became excited about various bits of gossip and trivia, but once you get beyond this you start to realise that nothing of great importance was leaked by WikiLeaks. Furthermore, what you see if you really think about it (which very few people did) was America and its allies trying seriously and professionally to solve many of the world’s most dangerous problems, yet often lacking the power to do so effectively. As for Julian Assange, he seems to mean well, but he doesn’t really come across as a man with a coherent plan. He talks about his objective being ‘truth’ and this method being ‘transparency’, but beyond this much of what he supports seems idealistic. For example, WikiLeaks did not expose Watergate-type corruption, although it did highlight the issue of distortion between real life and virtual reality (i.e. virtual training and screen interfaces reduce empathy for the enemy - see 'The Rise of Militainment' in News & Media section in this issue). Interestingly, perhaps, in an age of new media, WikiLeaks needed the traditional media to turn raw information into compelling narrative. Who, after all, has the time to read, let alone make sense of 251,287 pages of ‘secret’ information? Perhaps, this is where things will go next. Information vigilantes will continue to acquire information and will collaborate with journalists to get their stories across. Sometimes this will be good. It will stop abuses of power and provide a system of checks and balances. But when this power is abused, people will be prosecuted. They will also be outmanoeuvred. For example, it’s not rocket science to install software to detect unusually large downloads. There will also be more cyber-attacks against individuals and institutions publicly supporting or attacking certain issues, but again some of the people doing this will fall foul of the law. Transparency is very much a twenty-first century threat. There will, no doubt, be more leaks and more embarrassment, but beyond this, old hopes, old fears and old ambitions remain. Once the dust settles, people will realise that secrets sometimes make sense and that privacy sometimes has its uses. Ref: The New York Times (US), 11 December 2010, ‘ Keeping Secrets WikiSafe’ by S. Shane www.nytimes.com. The Financial Times (UK), 4-5 December 2010, ‘As Trotsky soon realised, transparency can go too far’ by R. Braithwaite www.ft.com., The Economist (UK). 11 December 2010, ‘The War on WikiLeaks: Fingered’. It’s not the end of history, but we are entering a new historical period. For most of human history, from year 1 to 1820, the world was dominated by Asia, and China and India were consistently the world’s largest economies. By the year 2050 this will be true once again and we will return to the default setting of the last 2,000 years. Probably. What does this mean for those of us living in the West? One implication is that Western individuals and institutions must cease using a Western lens to look at the world because this gives rise to a distorted perspective. For example, there is a popular assumption in Western culture that developing nations such as China eventually become ‘Westernised’. That ‘they’ become like ‘us’ through economic development. But de-Westernisation is a stronger possibility, especially when you stop to consider that there are 1.3 billion people in China compared to around 860 million in the West. Another assumption, based largely on the collapse of the Soviet Union and other Communist regimes in Eastern Europe, is that China’s Communist Party government cannot survive. This is a reasonable argument, especially when you consider the challenges of running a country where living standards have improved by 10,000% in a single generation (during the Industrial Revolution living standards in the UK rose by just 50%). But what if it’s Western democracy that declines? There’s also the idea that China’s economy will only collapse if Western economies do the same. But recent history would suggest that this might not be true. The Chinese government proved to be far more adept at managing its economy than its Western counterparts. A fourth assumption is that China cannot rise peacefully. This is a compelling thought. Throughout history the rise of one great power has lead to the inevitable decline of others and this often causes trouble. And talking of trouble, a universal recession could cause problems too. Is it just an historical accident that the Great Depression of the 1930s contributed substantially to the outbreak of WW2? If so, what would happen if the world were hit with another economic meltdown? Even if this doesn’t happen, some people argue that China’s rise will inevitably lead to tensions with the US. Possibly. In Europe there isn’t much rivalry because Europe gave up its hegemonic ambitions long ago. With the US it could be a little different, but we shouldn’t forget that it is in neither nations interest to rock the boat. China is keen to be seen as a responsible actor on the world stage, but even so it is constrained by a number of realities. Its vulnerabilities include a real estate bubble, its banking system, a development model based on cheap labour, an over-reliance on exports, weak domestic consumption, severe water shortages, access to raw materials, social inequality and rampant corruption. That’s quite a list, but don’t forget that China has managed remarkably well so far. That’s not to say that China’s rise is inevitable, but it is more than likely that by the middle of this century China will become an established and respected superpower alongside the US. Most people assume that China will eventually overtake the US to become the world’s number one economy and largest superpower. The US, after all, is being torn apart by political infighting, its economy is burdened by debt and its military is over-stretched by imperial obligations and widespread economic interests. Thus, while the past century belonged to America, this century is China’s. When this will happen is anyone's guess and depends on what you measure. Goldman Sachs says 2027, Standard Chartered says 2020. But as JFK once observed: ‘The one unchangeable certainty is that nothing is unchangeable or certain. Remember, for instance, predictions in the 1980s that Japan would soon overtake the US as the world's number one economy? First of all, the US is huge economically (China's GDP is currently only 40% the size of America's). From a GDP point of view China is large but on a per capita output basis it’s not – 8% the size of America’s and 12% of Japan’s. China has also yet to move from an economic model based on cheap labour to one based on technology and upstream innovation. Whether this can be done is open to question. Applying capitalism is one thing, but cloning the American Dream or Silicon Valley is another. Secondly, and much more importantly, China’s ascent doesn’t mean the destruction of the US. The US has been written off many times throughout history and has always bounced back. Anyway, that’s the wrong question to think about. China will not be immune from problems and the US will almost certainly decline relative to China, but the US will not fade away entirely. The critical issue is not whether one succeeds and the other fails but the nature of future US-Chinese relations, which will impact on everything and everyone in the future. Fortunately, the two nations have cordial relations even when they are seen to fight on the surface. They share economic interests (rather too closely for some people, which they argue causes imbalances) and many of the most urgent and important global issues (e.g. nuclear proliferation, rogue states, and climate change) impact both. Don’t forget either that the China we see today was partly created by the US. Washington’s support of Deng Xiaoping’s economic reforms in 1980 and the opening up of the US market are two examples that spring to mind. The US has also benefited commercially from China’s rise and China’s reinvestment of its trade surpluses into American treasury bonds (i.e. debt) has quite literally kept the US afloat in recent years. So, to sum up, China and America have a symbiotic relationship and for this reason alone it is highly unlikely that one will allow the other to fall. However, one should never use simple extrapolations to predict the future. In my view something will happen to either the US or China that almost nobody will see coming. To finish (this section) here’s a summary of ideas that some people think will shape our thinking during 2011 and beyond. In no particular order the thoughts, trends and technologies are: Cloud Living, Ambient Thought Fusion, Utilitainment, Biorhythm Syncing, Illness Prestige, Exome Sequencing, Bugs 2.0, Quantum Dots, Natural User Interfaces, Social Curation, Ocean Bioengineering, Unitasking (told you! ), YouTube Drug Monitoring, Mobile Micropayments, Connected TV, Open Genomics, Organic Electronics, The iPad Ecosystem, The Flight to Privacy (told you again!) and Trans-species 3D Printing. More on these and other ideas in future editions of What’s Next.